If you're worried that you don't have a sophisticated palate to discern one wine from another, you might want to take a look at MyOeno. Technology to the rescue -- there's an app for that! The device works by using visible and near-visible spectrum analysis that looks at specific absorption rates of wavelengths emitted by the scanner, and based on the absorption rates of those wavelengths, it will be able to provide detailed analysis of what you're drinking. 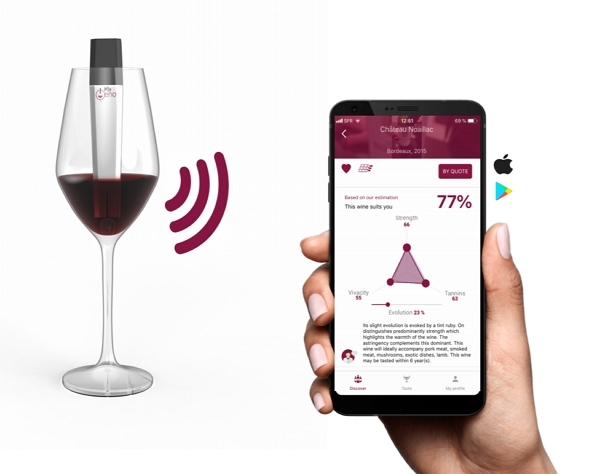 Just dip the scanning device into the glass of wine you're drinking and it will scan the contents of your wine to provide you with certain details about it, such as strengths, tannin content, vivacity, evolution and so on. Combine the scanner with your smartphone and the app will allow you to store certain information from those scans into a list of user preferences that will allow the app to construct an algorithm that fits to your taste. Give it a score from 1 to 10, and overtime, the app will crosscheck the parameters with your taste score. MyOeno goes beyond sharing the properties of wine. Over time, it will also suggest other types of wines that should suit your palate based on usage. So if you're looking for wines of other styles, just ask the app for lighter or fuller bodies of wine, etc. The technology remembers what you like and dislike about different wines that you've already tried and scanned. So the guessing game is removed, saving you from shelling out money on various wines that the app could have told you that you wouldn't like. Imagine, scanning the label of a bottle on a store shelf to help you find out how closely the wine matches your personal taste! The app will also help you to purchase wine, find wine by retailer or brand, and provides data on wine composition (polyphenols, pesticides or sulfites). You can find it on Amazon or the company website.